Socioeconomic Status (SES) is typically used to reference a person’s overall social standing in the community, incorporating their income, education level and occupation. One’s SES may influence their access to services or level of influence or privilege. Stigma toward people of lower SES compounds this disparity. Negative attitudes permeate the general thinking about people who are poor. Politicians, TV programs and the media falsely label people as lazy and not smart, perpetuating myths and stereotypes. In addition to the obvious harm, stigma impedes people from getting better paying employment, accessing healthcare or nutritional meals, and being fully included in society. In other words, stigma keeps folks in poverty. The poverty threshold for a family of four living in the US in 2013 was $23,834/year. 5 million (23%) of them were working poor, meaning they worked or tried to find work 27+ weeks/year, but whose income fell below the federal poverty line. Contrary to many people’s preconceptions, the majority of people between the ages of 18-24 who were unemployed report that illness or family are their reasons for not working. See table. Free lunches: many children are offered free or reduced priced meals through their schools, but due to stigma they decline the assistance, despite the obvious financial benefit and nutritional need. United States, Census Bureau, Poverty Thresholds. https://www.census.gov/hhes/www/poverty/data/threshld/index.html, Accessed 1/2/16. United States. Bureau of Labor Statistics, “A Profile of the Working Poor”, http://www.bls.gov/opub/reports/cps/a-profile-of-the-working-poor-2013.pdf, Accessed 1/2/16. 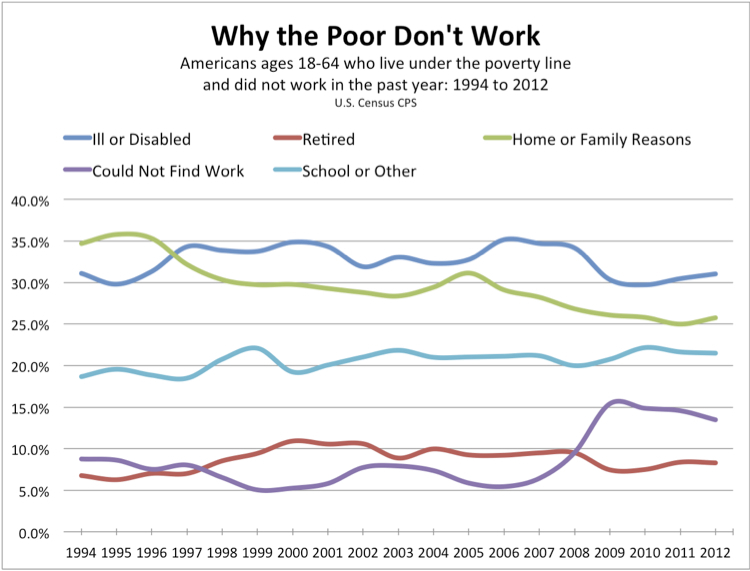 Jordan Weissman, Why the Poor Don’t Work, According to the Poor. The Atlantic Monthly, 9/13/13, http://www.theatlantic.com/business/archive/2013/09/why-the-poor-dont-work-according-to-the-poor/279900/, Accessed 1/2/16. Pogash, Carol. Free Lunch Isn’t Cool, so Some Students Go Hungry. NY Times, 3/1/2008. http://www.nytimes.com/2008/03/01/education/01lunch.html?_r=0, Accessed 1/2/16. Allen H1, Wright BJ, Harding K, Broffman L (2014.) The role of stigma in access to health care for the poor. The Milbank Quarterly;92(2):289-318. http://www.ncbi.nlm.nih.gov/pubmed/24890249, Accessed 1/2/16.